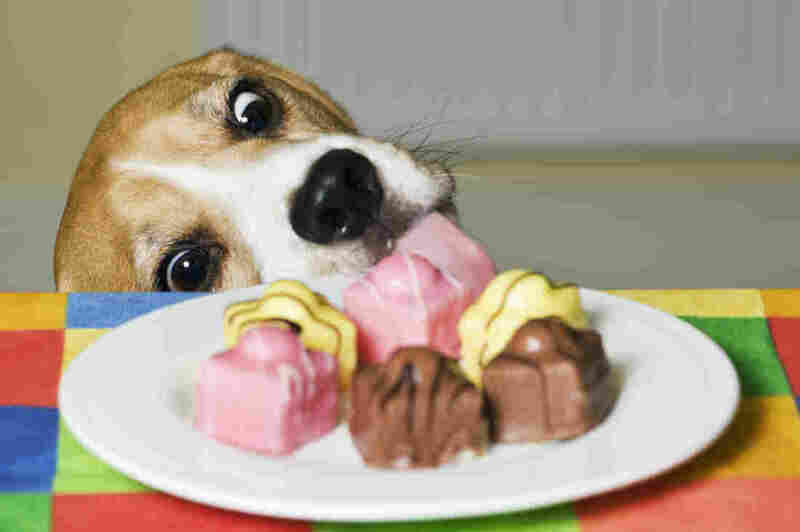 More Pets Are Eating Marijuana, And It's Not A Happy High : Shots - Health News The rise of legal marijuana seems to be fueling a spike in the number of pets that become unhappily high off of pilfered treats. The dose is rarely fatal, but it can be a buzzkill. Hard to resist. But if they're marijuana edibles, not such a treat. "What's wrong with you, buddy? What's wrong?" a man says to his dog in a video uploaded to YouTube last month. The pup moans pitifully and trips over himself. He's having trouble blinking. He gazes into nothingness; his eyes are a deep, black abyss. He's wobbling on his paws. The man's words dissolve into laughter. He knows the dog is high as a kite after thieving a potent marijuana brownie. It's a sad state that's becoming increasingly common. The Pet Poison Helpline, a 24-hour pet poison control center, has seen a fourfold increase in calls concerning pets experiencing marijuana intoxication over the past three years. The most dramatic rise has been over the past 12 months. This little guy got into his owner's stash of marijuana-laced brownies. "Over the past year alone, we've had double the marijuana exposures," says Dr. Ahna Brutlag, senior veterinary toxicologist at the Pet Poison Helpline. The American Society for the Prevention of Cruelty to Animals has seen a similar increase. In 2014, the ASPCA's poison control centers received calls on about 539 cases of animals accidentally consuming cannabis, up from 320 in 2013. "What's worrying to us is the severity of cases now," says Dr. Heidi Houchen, a veterinarian at Northwest Veterinary Specialists in Clackamas, Ore. "We still see the classic case: red eyes, wobbly, urinating on themselves, a little twitchy ... but they can progress through the sedate, leaning, urine-dribbling stage to becoming completely comatose or absolutely rigid. They've come in and had seizures. They can come in a panic, really sensitive to noise and touch. They can pass away." Part of the problem is that pets are sneaking away edible cannabis products. "If a brownie is sitting on the coffee table, that dog is going to eat it whether it has marijuana or not. I think the enticement and the opportunity for a pet is greater [with edibles]," Brutlag says. That poses a special danger for gluttonous pets. "It's not just going to eat one brownie; it'll eat the whole pan," Brutlag says. "The dose of what a dog would ingest relative to a human would be much greater." Dogs and cats might also be more susceptible to marijuana intoxication than humans. "Every species metabolizes drugs differently," says Dr. Stacy Meola, an emergency veterinarian at Wheat Ridge Animal Hospital in Wheat Ridge, Colo.
And problems with marijuana are still far less common than toxicity from things like over-the-counter medications, insecticides and rat poison, pet poison control centers say. All of those can kill animals far more easily than pot. It's possible that emergency animal care centers and poison hotlines are getting more cases simply because more states have decriminalized marijuana possession. "The stigma is being dissolved, people are just more forthcoming that their pet is getting into marijuana," Brutlag says. And she thinks it's also the case that as more states legalize medical and recreational marijuana, the drug is becoming more ubiquitous in people's homes. That raises the risk for poisonings, Houchen says, no matter what form the plant is in. Pets will munch on edibles or graze on stashes of dried buds without prejudice. "I've heard of animals getting into growing operations and eating so much that they're defecating undigested plant material," says Houchen. That kind of unchecked ingestion of marijuana can potentially be very dangerous. "Once you bring marijuana into the house and it's available, it should be kept up and away from the pets just as the kids," Houchen says. "If you want to use it, you have a medical license or whatever reason, great, but now do due diligence." Angus Rohan Chen is a reporter and radio producer living in New York City. He has a dry wit and no hobbies. Please be his friend on Twitter @angRchen.